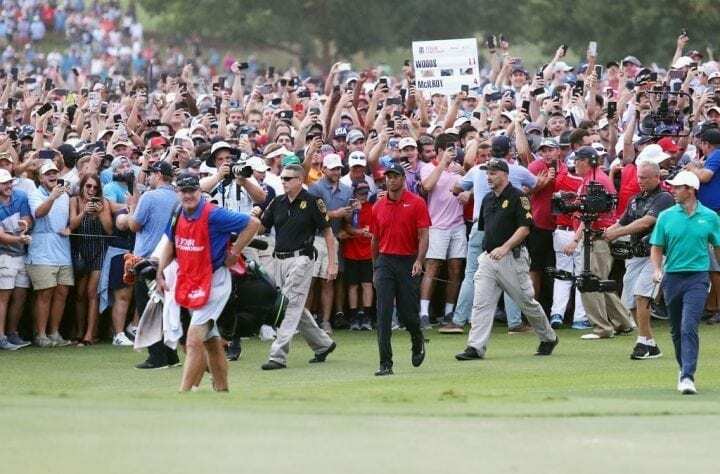 It's official - Tiger Woods is a PGA Tour winner once again and the whole golfing world (including the team here at Hole19 HQ) is in raptures. Finally, there's no more need for those heated 'will he, won't he' debates on social media. For the first time in five years (1,876 days, in fact) Woods found his way into the winner's circle with a mightily impressive two-shot Tour Championship win. Questions of whether the 14-time major winner could overcome his past injury and personal problems and add to his 79 PGA Tour wins were well and truly put to bed during the final round of the 2017/18 PGA Tour season on Sunday past. Sunday's win at East Lake Country Club was Woods' 80th on the PGA Tour and one achieved in a classic wire-to-wire fashion. With four rounds of 65-68-65-71, the great man set himself apart from the field and never truly looked threatened. Although we had seen him in contention earlier this year, by the end of Saturday's third round it seemed clear that something altogether different was happening. The impressively professional way in which he managed Sunday's final round very much harped back to the Tiger Woods of bygone years. While others were faltering all around him there was an assured calm to Woods' play. Both the PGA Tour and the European Tour have been attempting to formulate creative ideas to help broaden the appeal of golf and to get people engaged in actually playing the game many of us love. Fact is, there's absolutely no substitute for a healthy and in-form Tiger Woods when it comes to creating tangible golfing excitement. What was made pretty clear during Sunday's final round is that golf is more far-reaching when Woods is around and competing at a high level. Let's just take a minute to appreciate what's actually happened here. Back in January of this year when appearing at Torrey Pines for the Farmers Insurance Open a T-23 finish saw Woods rise no higher than 539th in the Official World Golf Rankings. Along the journey to a new healthy 13th placed position, there have been chipping yips, putting yips and an entire golf game that seemed light years from challenging at the top of the men's game. There's now a more polished, refined look to Woods game and, more importantly, he is starting to challenge on a regular basis. On the immediate horizon for Woods and the other 11 members of Team USA is the little matter of the 42nd Ryder Cup and a chance to secure the first win on European soil in 25 years. If Jim Furyk's side is to retain the trophy for another two years before again defending at Whistling Straits it is likely that a revitalised Woods will have an important part to play. Next season will be all about the majors and attempting to reel in Jack Nicklaus' record by adding to the current haul of 14. Now with the comeback win under his belt, Woods will look to build on a solid sole second place at Bellerive Country Club at the final major of 2018, the PGA Championship. Time will tell if this is a welcome flash in the pan, or whether something special is bubbling to the surface all over again. One thing's for sure, it'll be a pretty awesome ride as we find out.